Land Transport Authority (LTA) has awarded an exclusive seven-year contract to JCDecaux SA, giving the brand access to 1,459 bus shelters across Singapore. The contract was previously held by Mediacorp OOH Media. 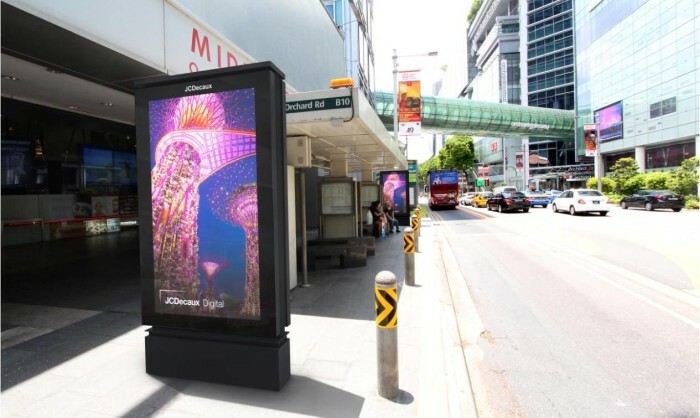 The concession includes 800 advertising panels, comprising digital screens notably on Orchard Road which offer a comprehensive digital out-of-home (OOH) network in the city. The brand looks to deploy its smart digital solutions on its assets to maximise the impact of advertising and create greater experiences for the audience within and beyond the screen. With this extension, JCDecaux will be able to have an extensive footprint in Singapore, including prime shopping and financial districts of Orchard, Scotts Road and Shenton Way, as well as central areas such as Beach Road and Tiong Bahru. These urban areas have a high concentration of tourists, professionals and business decision-makers, in addition to major Housing and Development Board towns such as Ang Mo Kio, Punggol and Toa Payoh. The addition of the bus shelter platform to the brand’s existing portfolios of airport, malls, cinemas and billboards will strengthen the brand’s islandwide presence, allowing advertisers to reach a wide range of audiences on the move across various segments, the press statement read. According to Jean-Charles Decaux, co-CEO, JCDecaux, its footprint in Asia started in Singapore almost 20 years ago with the LTA’s Bus Shelter contract. “This is also an opportune time for us to bring to this smart city our best digital media assets combining with our unique content management platform, SmartContent, which will serve to enrich the ways brands communicate with the millions of commuters daily. Creating good value for our advertisers and providing innovative and quality service to the city are always at the heart of our strategy,” Decaux added. LOOK Fancy staying in a Škoda? There are only so many ways to market a car, right? Wrong. Škoda in Russia proved creativity can get you places, literally, with i.. The company has moved away from Nielsen citing limitations posed by this conventional method of measuring radio listenership. ..